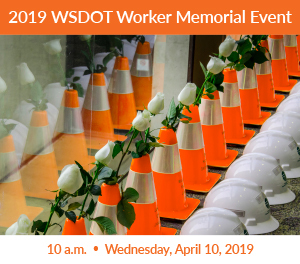 "... To preserve the memory of the Washington State Department of Transportation fallen workers and to provide assistance to active and retired employees and their families in times of need." Henry D. Willis, April 16, 1954, Southwest Region, engineer laborer. Henry was killed while drilling a test hole near PUD electrical lines on a highway relocation project between Cathlamet and Skamokawa. A co-worker received an electrical shock trying to save Henry, but survived. Harrell J. Shull, April 29, 1959, South Central Region, maintenance technician. Harrell was killed near Saddle Mountain east of Ellensburg when he was struck by a passing vehicle while removing trash from a ditch along a highway. A co-worker was also injured in the crash. The annual luncheon for the WSDOT Retirees (RWSDOTE) is Wednesday, May 22nd at Seventeen51 Restaurant (Panorama City). Social Hour at 11 am, Dinner at noon and guest speaker at 1 pm. Secretary of Transportation Roger Millar (second from left) with several of the Foundation Board Directors at the April 4th Worker memorial Event. Left to right: Troy Cowan (Foundation President), Chris Johnson, Bill Ford (Foundation Executive Director), Grant Rodeheaver (Foundation Vice President), Bart Gernhart and Jeff De Vere. Wish to honor a loved one? The Foundation will work with you to create a restricted giving fund. CONTACT US to find out how easy it is to support and honor those you cherish most. A Monument in the making! Submit Your Photos to Make the Monument Your Own!